The Pugio dagger was a dagger that was used by both the Romans and the Greeks. It was a very versatile item, useable as both dagger and utility knife. 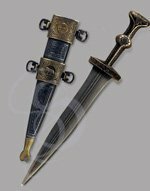 It was also likely that this was the dagger that ultimately killed Julius Caesar (in fact, it seems that all of Julius Caesar's assassins used pugios to finish him off on the Ides of March). 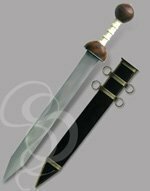 This dagger is a historically accurate example of the roman style pugios worn by soldiers and civilians alike in Rome. It features a beautiful, fully tempered, high-carbon steel blade with a full tang. The blade has the classic "waisted" shape that was so popular among Classic Age blades. The beautifully grained wood hilt is one solid piece of hardwood, polished and tipped with a lustrous brass cap. A polished brass shock plate is set against the base of the guard, perfectly true to actual Pugio examples discovered by archaeologists. 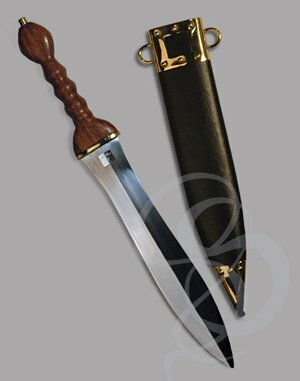 A wood scabbard, wrapped in black leather and ornamented with stylish brass collar and tip, comes with this dagger (and complements it nicely, we might add). Overall, this is probably the nicest functional pugio we carry (nice as in, it says "Excuse me" before it plunges through the hearts of enemies). (Please do not plunge this through anyone's heart. That other sentence was just a figure of speech and a feeble attempt at humor). The tempered blade, handsome design and dazzling scabbard make an admirable addition to any costume or uniform and a fine display piece for any home.